I understand you are in receipt of an IRS Form 668-W regarding me, (your name). (employer/Company name) should be committed, as a matter of policy, and civic duty, to upholding the law, and to complying with all lawful obligations to which you are subject. 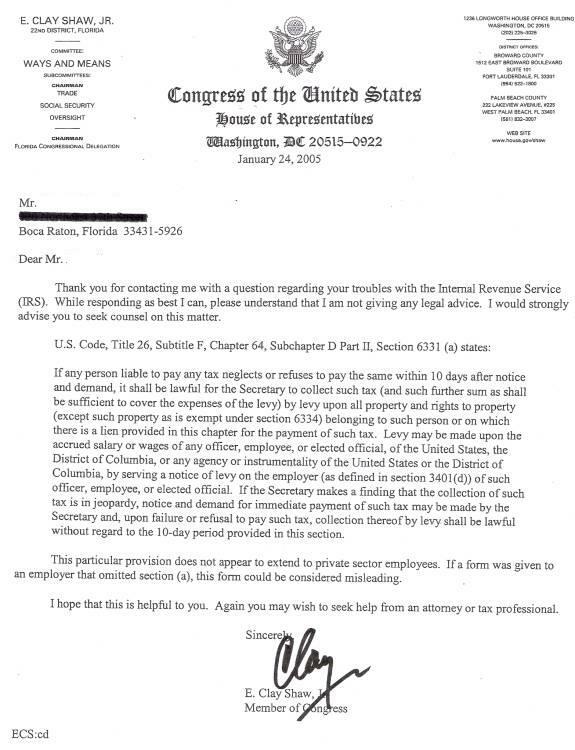 The IRS asserts such an obligation in their form, but you should be aware of several areas in which the assertion, the statutory authority under which it is made, and the facts regarding me are in conflict, and may lead to your direct liability for damages to me, personally, if I am forced to seek legal redress. (ii) State and municipal employees: Salaries, wages, or other compensation of any officer, employee, or elected or appointed official of a State or Territory, or of any agency, instrumentality, or political subdivision thereof, are also subject to levy to enforce collection of any Federal tax. (iii) Seamen: Notwithstanding the provisions of section 12 of the Seamen’s Act of 1915 (46 U.S.C. 601), wages of seamen, apprentice seamen, or fishermen employed on fishing vessels are subject to levy. for were that actually the case, subparagraphs (ii) and (iii) cited above would be superfluous and redundant. If the compensation of "any person" actually can be, or lawfully is, reached by levy, then no further specification is needed. If you are inclined to entertain uncertainty in this regard, please be mindful of the United States Supreme Court’s instructions in American Banana Co. v. United Fruit Co., 213 U.S. 347 (1909) that, "Words having universal scope, such as ‘every contract in restraint of trade,’ ‘every person who shall monopolize,’ etc., will be taken, as a matter of course, to mean only everyone subject to such legislation, not all that the legislator subsequently may be able to catch." , and in Gould v. Gould, 245 U.S. 151 (1917) that, "In the interpretation of statutes levying taxes it is the established rule not to extend their provisions, by implication, beyond the clear import of the language used, or to enlarge their operations so as to embrace matters not specifically pointed out. In case of doubt they are construed most strongly against the government, and in favor of the citizen." 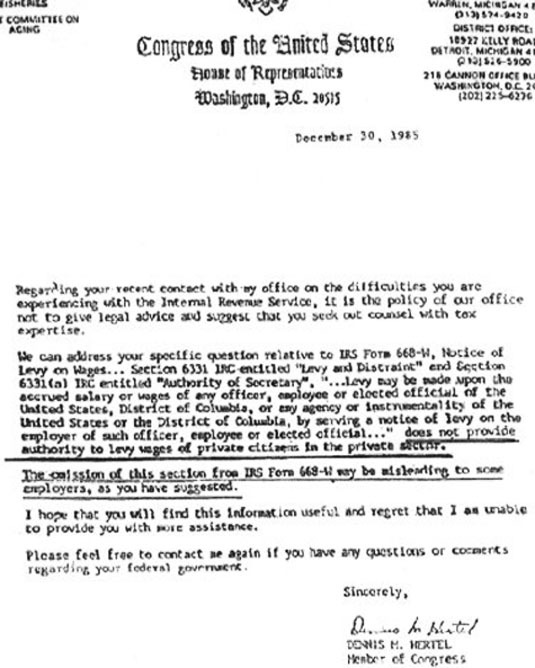 For further official confirmation of my position, see also the copy of a letter (next page) from a sitting member of congress to his constituent on the subject of private citizen levies. Please also note the enclosed letters from Congressmen regarding this issue. Your obligation to me, as your associate, is entirely unambiguous and, thus, I hereby formally demand that you seek further clarification from the IRS before continuing to honor their directive. In order to ensure that no one is the victim of a misunderstanding, and to protect COMPANY NAME from the possibility of legal action for any of several possible criminal and civil offenses which would be attendant upon your continued diversion of money which is legally my property, unless done as strictly and unambiguously required by law, I respectfully, and in good faith, demand that you require the following letter and statement be sent to the IRS, (both attached) and be executed by the IRS, under penalty of perjury, by someone of sufficient authority with the IRS and returned to COMPANY NAME in order to verify your necessary obligation to comply with their directive before any [further] monies are withheld without due process. I thank you for your courteous and expeditious attention to this matter, and look forward to the results of you inquiry.